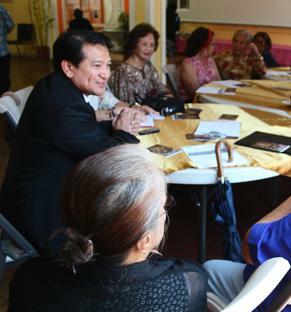 On the occasion of the celebration of Philippine National Heroes Day Austin G. Baul, president of the Filipino American Community of Los Angeles (FACLA), exhorted the audience to “bring out the heroes in all of us” in order that we may achieve unity in the Filipino American community. Monday, August 27, is listed in the Official Gazette of the Republic of the Philippines as National Heroes Day, one of the nationwide regular holidays and special non-working days for the year 2012. 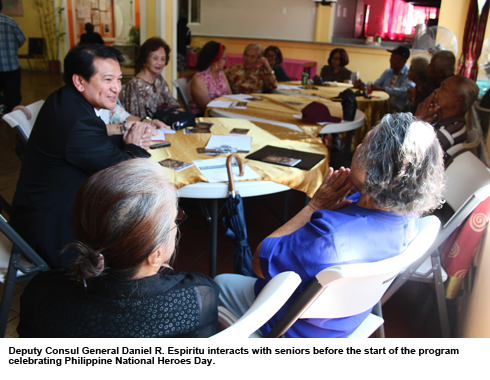 But even as Mr. Baul lauded some achievers including caregivers and professionals as his kind of heroes during the August 31 event, there was also a sense of apprehension that a serious act of incivility may have been committed against the office that Los Angeles-based Deputy Consul General Daniel R. Espiritu, the invited guest speaker, represents. PinoyWatchdog was invited to the event a day prior by Mr. Baul himself. It was scheduled from 11:30 am to 4 pm and on the appointed time the deputy consul general, the invited guest speaker, was said to have arrived with an aide. But the audience was nowhere around and the officials were told to come back. About an hour later the Honorable Espiritu, who is slated to become the officer-in-charge with the recall to the Manila office of Consul General Aragon at the end of the month, was back. He was directed to a group of three men and nine women gathered around an extended table in one corner of the social hall of FACLA. With them was Arturo Garcia, national coordinator of the Justice for Filipino American Veterans (JFAV) and at the same time a director of FACLA. This reporter was handed an invitation with a JFAV letterhead indicating that it was a “monthly meeting and the 3rd Annual Commemoration of the Philippine National Heroes Day” signed by Mr. Garcia. It also carried the unsigned name Jovy Alejandrino, president, S4PACE. 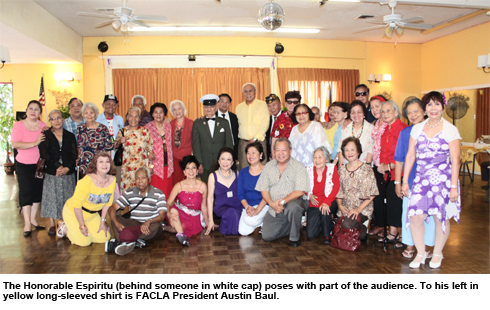 This reporter noted that FACLA was not mentioned in the invitation as part of the celebration. After making a statement the Honorable Espiritu entertained questions and after which Mr. Garcia informed him that he could go already. The consulate official was prevailed by others to pose for a photo with the other community members gathered in the same social hall. The program was about to start and the Philippine official left. I thought it strange that a top official representing the government of the Philippines was not given a speaking part in the program celebrating a Philippine national holiday. I took my concern to the attention of FACLA officers Baul and Garcia and noted a sense of nonchalance from them. Garcia even said that the deputy consul general was in a hurry but I didn’t believe him because the Honorable Espiritu even agreed to an interview with PinoyWatchdog and PINAS newspaper, represented by my wife Lilia. I recall of instances in the past when some countrymen complained about the difficulty of inviting officials of the consulate to speak in important events. One of them I was very familiar with involved the president of the Southern Leytenos of Southern California (SLSC) during the administration of Consul General Paynor. He had written letters and had gone to the consulate more than once because of his organization’s desire to have a Philippine official officiate in the induction of a new set of officers. They didn’t even receive the courtesy of a reply, the SLSC head said. I was mulling on that FACLA happening as we — my wife and I — proceeded to the Kapistahan Grill nearby. At the next table was the deputy consul general and his aide having lunch. They didn’t appear to be in a hurry.